In this video Vishay will cover what is a relay, solid-state switch versus solid state relay, as well as target markets and applications of the VOR family of Solid-state relays. Introducing the VEMD8080, a high-speed PIN photodiode with enhanced sensitivity for visible light and offered in a slim sensor package that is ideal for wearable applications. This video highlights the TCUT1630X01 which is a unique 3-Channel Slotted Interrupter for Turn and Push Applications. Vishay’s Minimolds are capable of infrared reflow and eliminate the secondary wave soldering process. How do you stop an automatic garage door from closing if something or someone is in its path? Vishay's TSSP4038, TSSP6038, and TSSP58038 eliminate problems with fixed gain allowing customers to set the detection threshold at a specific level. The VBP photodiodes have versions which are sensitive to visible and infrared light. This short webinar highlights the key features of this family and identifies potential consumer applications into which, these devices could be designed. Features of the VCNL4040 include a selectable resolution for the proximity function, either 12- of 16-bit, the use of our patented Filtron technology to yield the best ambient light sensing performance second only to the human eye. Bigbelly solar compactor uses Vishay emitter and IR receiver for smart, energy efficient designs. This is a new ambient light sensor for Vishay, part of their Light to Digital Product Portfolio. This video will introduce you to this new ambient light sensor and its features and applications, along with other resources. In this demonstration of a reflective sensing application we will show how the VSLB3940 Emitter and the TSSP4038 Presence Sensing IR Receiver can work together. Most of us are exposed to large amounts of UVA throughout our lifetime. UVA rays account for up to 95 percent of the UV radiation reaching the Earth's surface. The VEML6070 has a peak sensitivity of 355 nm and a sensitivity range from 280 to 400 nm. Learn about the VOW Advantage. 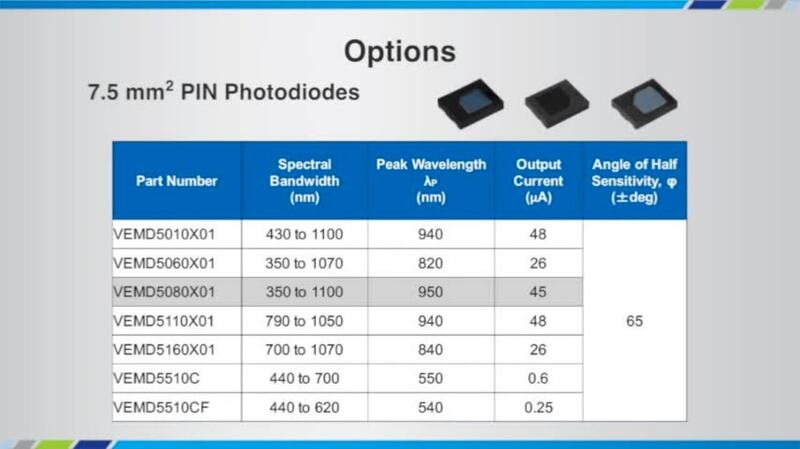 Three new widebody optocouplers ~ IGBT Driver, 1 MBd Analog, and 10 MBd Digital. 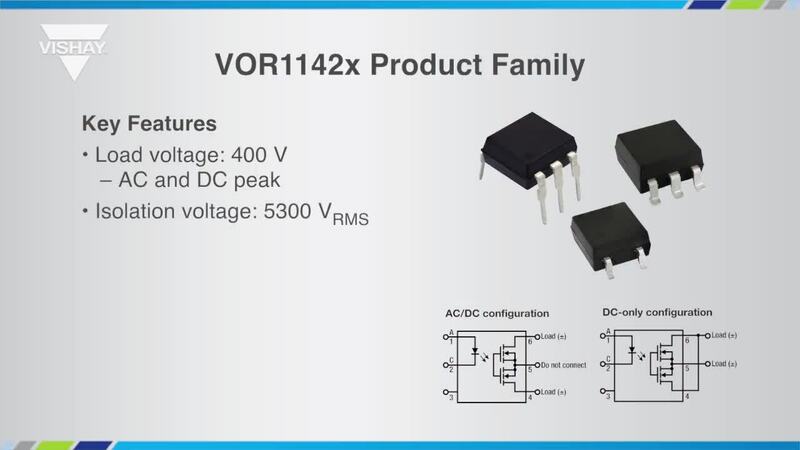 VCNL4020X01 is an Infrared emitter, proximity detector, ambient light sensor and signal conditioning IC in a single package qualified to automotive AEC-Q101. Product introduction video showing unique features and benefits of the VCNL4020X01. Performance parameters of the VCNL4020 gesture system are set using an I2C interface. The Optoelectronics group of Vishay Semiconductors is introducing two new power phototriacs: the VO2223 and the VO2223A. This presentation provides a brief overview of these parts. The VCNL4020 combines an IR emitter, a photo-pin-diode for proximity, an ambient light detector, a signal processing IC, and a 16-bit ADC in one small 4.8 mm x 2.3 mm x 0.8 mm rectangular leadless (LLP) package. An overview of Vishay LCD display products. This short video shows the demonstration cases and the specific products (including main features), which are shown in these cases.